Welcome and Thank you for visiting the Forty Fort Business and Professional Association. This site has the best Forty Fort has to offer. If you are looking for cars, gifts, flowers, carpeting, restaurants, furniture, clothing, signs, music, entertainment and more, you have come to the right place. Since the beginning of the twentieth century, when Forty Fort consisted of scattered homes and acres of farmland, the borough has developed into a pleasant, largely residential community with a number of thriving businesses. 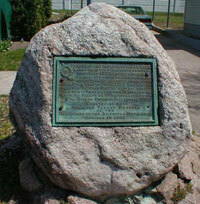 Forty Fort, so named for the original forty settlers, was begun in the summer of 1770. It was located on the river bank near a "copious spring of water, known as the Great Springs." Opinions differ, but authorities lead us to believe that it enclosed an acre or more of land. The walls were of logs, and these were set upright in a trench five feet deep. The logs extended twelve feet above the surface of the ground and were sharpened at the top. The joints and crevices of the upright logs were protected by another tier of logs planted and secured in like manner, thus forming a double wall. Within the fort, barracks or huts were built along the walls for shelter for the occupants. The roofs of these buildings served as a platform from which the garrison could defend the fort. The space in the center was used as a parade ground.